STATE COLLEGE, Pa. (AP) — Penn State running back Saquon Barkley is entering the NFL draft. Barkley announced his decision to skip his senior year Sunday, a day after helping Penn State beat Washington in the Fiesta Bowl. In a letter posted to his Instagram account, Barkley thanked Penn State fans, teammates and coaches and said he promised his parents and coach James Franklin that he would return to complete his journalism degree. Barkley ran for 1,271 yards and 18 touchdowns this season and had 54 catches for 632 yards and three TDs. He also completed two passes — one for a score — and returned two kickoffs for touchdowns. On Saturday in Glendale, Arizona, he ran for 137 yards and two touchdowns and caught seven passes for 38 yards in the No. 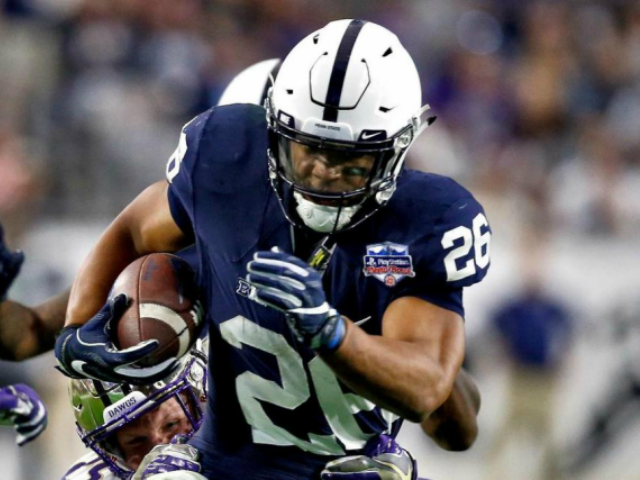 9 Nittany Lions’ 35-28 victory over No. 12 Washington. The 5-foot-11, 233-pound back was an immediate contributor as a true freshman and rose to national prominence as one of the country’s most dynamic players. He used a frenetic running style to compile a lengthy highlight reel full of hurdles, spin moves and jukes en route to a program-best 43 rushing touchdowns.